David Beckham and his investors have purchased the private land needed for a new stadium in Overtown, the organization announced Thursday, marking the first time the celebrity athlete has actually acquired Miami real estate for his Major League Soccer franchise. The milestone gives the Beckham partnership ownership of about two-thirds of the nine-acre stadium site, according to the statement, and comes after more than two years of failed bids involving three other locations. The deals allow Beckham to now move fully into the political arena to win county approval for the purchase of government-owned land needed to complete the site for the stadium, and city approval of a zoning overhaul needed to build it. Miami Beckham United, the corporate entity Beckham owns with Claure, American Idol creator Simon Fuller, and others, has never made this much progress in its high-profile pursuit of a Miami stadium. Beckham wants a 25,000-seat home for the MLS expansion team he was given the option to purchase as a bonus for signing with the L.A. Galaxy soccer squad in 2007. Beckham’s option to purchase the franchise at a deep discount has been extended as his negotiators failed to land deals to build a stadium at PortMiami, next to the AmericanAirlines Arena in downtown Miami, and, most recently, across from Marlins Park in Little Havana. The current site sits just north of the Miami River, in western Overtown and a short walk from the Spring Garden neighborhood. Bounded by Northwest Eighth Street to the north and Sixth Street to the south, the nine-acre property would be privately owned by the Beckham group, which began publicly chasing a Miami stadium in late 2013. 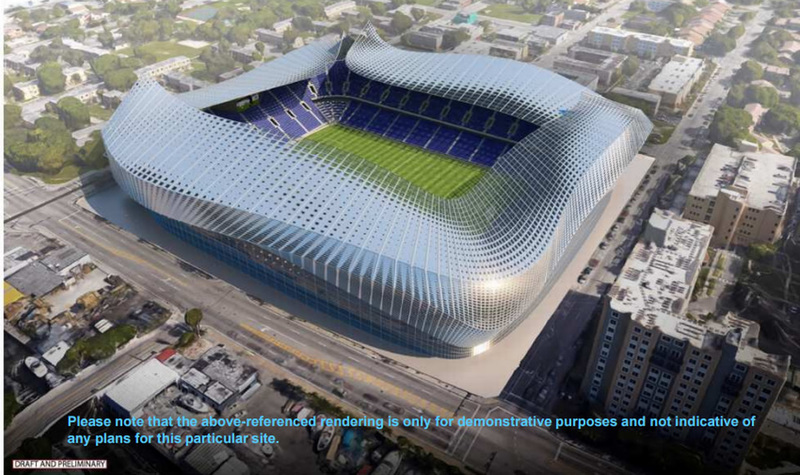 Beckham and partners are not asking for local subsidies to build or operate the stadium, and also say they plan to pay full property taxes for the land and venue. When the Marlins Park deal fell through in late 2015, Beckham declared Overtown his new top choice. The Dec. 4 announcement on Overtown included news that the partnership had, for the first time, signed sales contracts to purchase land for a stadium. Actually buying the nine-acre property has taken longer than expected. Beckham and his ownership group hit delays in trying to close real estate deals for about six acres worth of privately-owned parcels surrounding an Overtown truck depot owned by the Miami-Dade Water and Sewer Department.